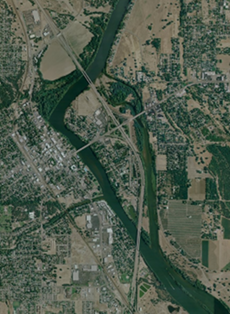 This data library provides public access to a wide array of geospatial data developed for the Sacramento River. 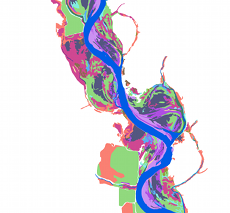 The Sacramento River GIS was co-developed by the California Department of Water Resources and the Forum as a planning tool to help resolve management questions as they arise at specific river locations. Visit the GIS Viewer, an interactive map which can load much of the Sacramento River GIS data onto the map as layers. 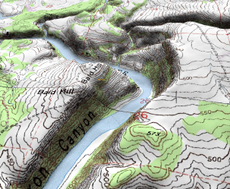 Navigation and query tools allow interaction with the GIS data. KMZ & KML files are viewable in Google Earth. If you don't have Google Earth, you can download it here: earth.google.com. Once installed, just click on the KML files below to download and view the GIS layer. Shapefiles and aerial imagery are viewable in open-source GIS software such as Quantum GIS and commercial software such as ESRI's ArcMap, ArcView, ArcReader. 2007 riparian vegetation data viewed in a GIS. Each color represents a distinct vegetation type. 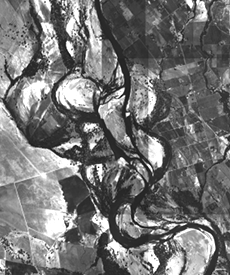 1938 aerial imagery of the Sacramento River. 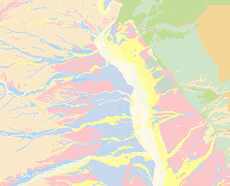 Sacramento Valley Geology data viewed in a GIS.